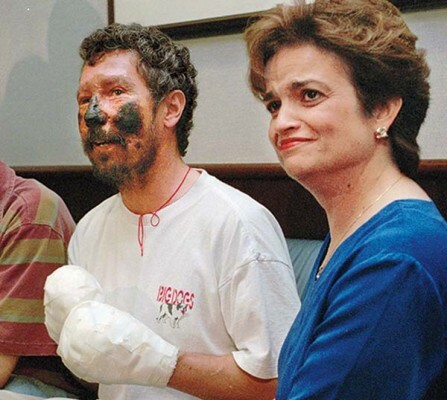 On the night of May 10, 1996, Beck Weathers huddled with 10 other climbers on an exposed stretch of Mount Everest, 26,000 feet above sea level. A blizzard churned the air into a slurry of ice and snow. Their supplemental oxygen was fully depleted, and they struggled for each breath. They yelled at one another and pounded on each other’s shoulders to stay warm and conscious. Even a wink of sleep could prove fatal. Weathers, a 49-year-old Dallas pathologist, was worse off than most. Earlier that day, he’d gone almost entirely blind — the altitude-induced effect of a recent corneal operation — and as the sun set, his body temperature dropped and his heart slowed. He then slipped from consciousness. “I don’t remember this,” Weathers says, “but at some point I stood up and announced, ‘I got this figured out!’ Then the wind hit me in the chest, and I went flying backward.” At the time, they seemed like last words. Weathers was hardly the only imperiled climber on Everest that night. Similar life-and-death dramas were taking place all over the upper reaches of the mountain. In the end, eight climbers, including Weathers’ lead guide, Rob Hall, would die. It would prove to be the deadliest event in Everest’s history up to that point, and it soon became the most famous, garnering headlines and being immortalized in Jon Krakauer’s 1997 bestseller, Into Thin Air — and now, Everest, an Imax film starring Jake Gyllenhaal, Jason Clarke, and, as Weathers, Josh Brolin. While Weathers lay in the snow on Everest’s South Col, most of the climbers in his group were escorted to safety. But both times rescuers reached Weathers, they deemed him a lost cause. He was breathing but appeared to be in a deep hypothermic coma, as good as gone. At 6 the next morning, Weathers’ wife, Peach, got a call from his outfitter, Adventure Consultants. They were sorry to inform her that her husband was dead. Nineteen years later, Weathers, now 68, sits in his spacious North Dallas home. There are no mountaineering mementos on the walls — no pictures of ?Weathers braving the Vinson Massif or the Carstensz Pyramid, no crampons or climbing ropes. The only object that evokes his mountaineering past is a photo of his post-Everest reunion with Peach — his hands covered in bandages, his cheeks and nose charred black by frostbite. Weathers’ body is testament enough. His right arm, decimated by frostbite, was amputated between the elbow and the wrist. His left hand, robbed of all its fingers, has been surgically reshaped into an appendage that Weathers calls his “mitt.” His nose has been completely rebuilt. It was constructed with skin from his neck and cartilage from his ears and, in a particularly surreal detail, grown on his forehead for months until it could become fully vascularized. (It was then sliced off and attached to his face.) His joints are creaky. His circulation is poor. He once worked out 18 hours a week, but now he gets his exercise by walking through a local mall. “I’m just ripping a corner around Nieman Marcus ladies wear, and I think to myself, ‘How the mighty have fallen!’ ” he says, laughing. Twenty-two hours after the start of the catastrophic storm and 15 hours after he entered the hypothermic coma, Weathers’ body warmed to the point at which he miraculously regained consciousness. His first thought was that he might be back in Dallas. Then he saw his right hand. It was lifeless and gray — a piece of frozen meat. He whacked it against the ice, and it made a hollow sound. He was not in Texas; he was on Everest’s South Col, and he needed to start moving. Weathers set off in what he hoped was the direction of High Camp, where an hour later, he stumbled to safety. No one in camp thought he’d survive, but he regained some strength, and the next day, began an assisted descent, cracking jokes on the way. (“They told me this trip was going to cost an arm and a leg,” Weathers said. “So far I’ve gotten a better deal.”) He made it to the Khumbu Ice Fall, just below 20,000 feet, where a Nepalese army helicopter picked him up. Krakauer didn’t know the half of it. As Weathers revealed in his own book, Left for Dead, for two decades before his Everest climb, he had battled a serious and at times life-threatening depression. The mountains were his only salvation from what he called “the black dog,” the one place where he had a real sense of happiness and peace. (“Everything else in your entire life disappears, and it’s just one step after the other,” he says.) He’d been a committed motorcyclist and sailor but had gotten hooked on climbing on a trip to Rocky Mountain National Park when he was 40. He soon was pushing himself toward loftier, ever more treacherous goals — almost always at the expense of family life. He would wake up at 4 am to exercise, spend all day working at the hospital, then barely nod hello when he got home before dropping into bed at 8 pm. He would take multiweek trips to places like the Indonesian province of Papua and the Kabardino-Balkar Republic to climb the seven summits, the tallest mountain on each continent. Even on vacations with Peach and their two kids, Weathers would spend time training or hiking. Peach told her husband that his climbing was eroding their life together, but Weathers persisted. It had long since ceased being purely therapeutic. Weathers’ depression had “slunk off,” and now climbing was about ego, what Weathers calls, “my hollow obsession.” By the time of the Everest ascent, Peach decided she could no longer take it and planned to divorce her husband as soon as he returned. 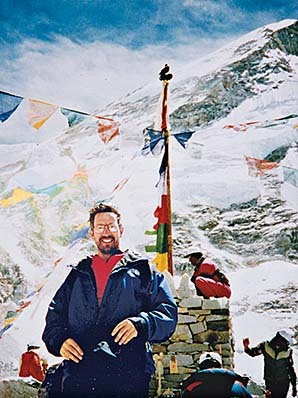 But after his near-death ordeal, she gave him another chance: “If you can prove to me in a year that you’re a different person, we’ll talk about it.” Weathers saw what his future held if he continued on his pre-Everest path: “I had absolutely no doubt I’d end up as the most successful lonely guy I knew — divorced, estranged from kids, miserable.”? Peach worried that it wasn’t safe for her husband to be flying and let her husband know his exploits were once again driving a wedge between him and his family. Nearing 70 years old, Weathers figured it was time to bow to his wife’s better judgment.